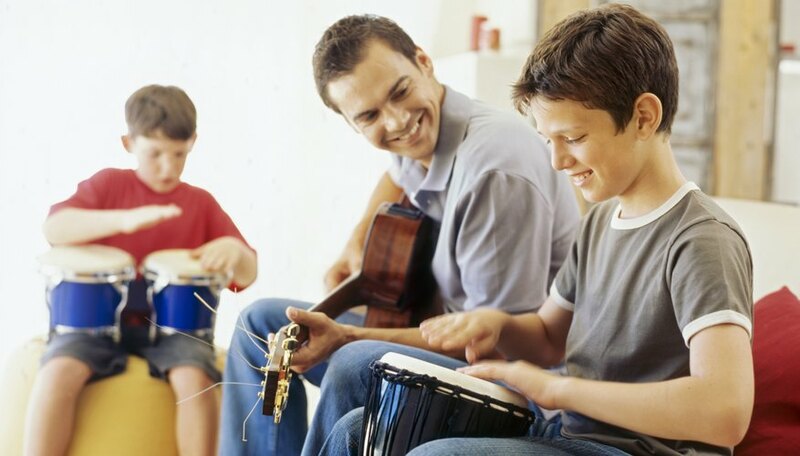 Bongo drums are percussion instruments used in Latin American music. They are played in pairs, and each set of bongos consists of a macho (male) and hembra (female) drum tuned to different pitches. Bongos are played by hand and help keep the rhythm of dances consistent and quick. Make your own pair of homemade bongos. Select two bongo drum shells. These can be made from anything round and hollow inside, whether cardboard, metal, plastic or wood. Examples include round popcorn tubs, coffee cans, barrels, round shipping containers, buckets or carpet tubes. Make sure the shells are clean. The shells may be of two different sizes or they can start out the same size. Remove any tops of bottoms from the shells so that they are open tubes. Cut one shell to stand about 8 inches from the ground and the other to stand about 12 inches from the ground. (If you have shells of different sizes, cut the shell with the smaller diameter to 8 inches, and the larger shell to 12 inches.) The shorter bongo will be the higher-pitched hembra, and the taller bongo will be the lower-pitched macho. Place the drum heads over the tops of the bongo shells. Drum heads are available at music stores; you want drum heads used for tom-tom drums. The drum head should extend about 2 inches from the sides of the shells. Dampen the drum heads and mold them to fit over the shells. Put glue around the tops of the bongo shells and glue the heads down to the sides. Let the glue dry. Drill two holes about 1/4-inch wide, 1 inch apart, through the drum head and bongo shell, about 1 inch down from the top of the bongo. Run sturdy cord (like that used for lashing or for camping purposes) twice around the head of the drum, then through the holes and tie tightly. This will help keep your drum heads tight. Paint or decorate your bongos and let dry. Once dry, glue the two drums together side by side and wrap them together with cord.